In late July, when a couple parked their Class C on Brean Beach in Somerset, England, little did they realize that their day was about to get very interesting. When the couple returned from a walk, the incoming tide surrounded the vehicle and its wheels sank deep into the sand. According to Burnham-On-Sea.com, the official website for BARB Search & Rescue, the couple didn’t realize the tide would come up so high and the vehicle was winched from the beach. 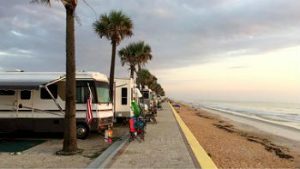 RVing on the beach is something every RVer can imagine. 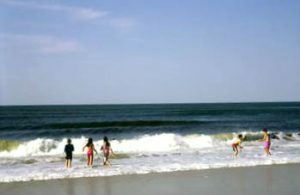 Yet campers need to realize that a beach setting—no matter where you are—is still a wilderness area. There may not be towering trees or lingering wildlife, but a sandy beach has its own series of tricky elements, which can present some challenges if you’re not ready. 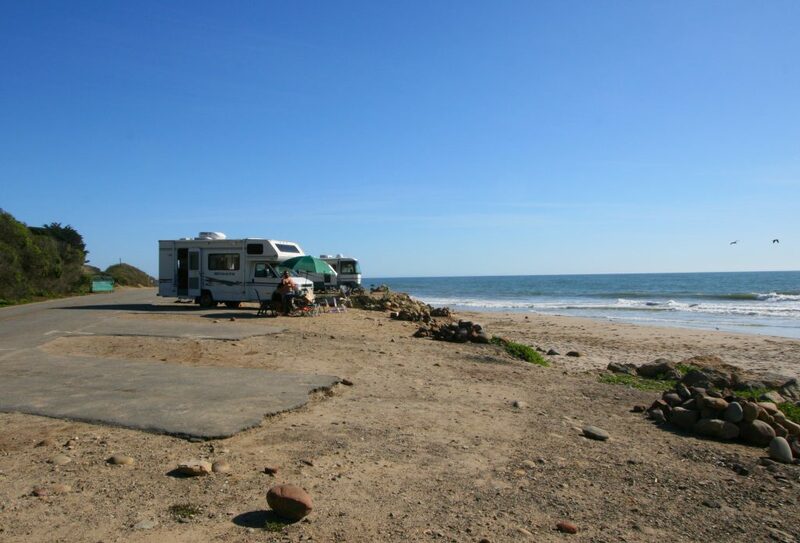 According to Dena Bellman, Associate Park & Recreation Specialist for the Oceano Dunes District of California State Parks, RVers should first inquire at campground offices about current beach conditions. She also suggested to familiarize yourself with the beach terrain prior to driving your rig to a site. Prior to driving on sand, deflate the tires of a motorhome or trailer by up to 50 percent. This spreads the tread wider to attain a better grip. Dig out the sand from around your tires with a shovel. Don’t allow your wheels to spin, this will only make the RV dig deeper into the sand. Place plywood or other surfaces under the tires to attain a better grip. Wet the sand in front of the RV to help compact the sand. Don’t let your vehicle get deeply buried before calling for a tow. Water slowly creeping up at your campsite is not a good thing. Bellman stresses that RVers need to recognize what is called “reading the rack.” This indicates the area where the tide washes up on the beach and is determined by wet, compacted sand outlined by seaweed along the shoreline. An RVer should place themselves well above that area to camp. Simply put, parking on wet sand means you are in the path of an upcoming tide. When that happens, water starts to surround the tires, it gets sucked down into the sand, and will eventually wash the RV out to sea. Always park your RV with the doors away from the ocean. It seems ideal to park your RV facing the water, when in fact this is not the greatest idea. According to Bellman, most RVers park their RV with the doors away from the ocean to deflect wind. This position also prevents wind from blowing directly at the canopy, which, in turn, can potentially cause damage (as well as parts other parts of the unit were the canopy attaches). Place plywood (or another solid surface) underneath leveling jacks (or even tires) to prevent sinking in the sand. Set up mesh, plastic or plywood sheets against your ocean-facing walls of your RV. This blocks sand from blowing out from underneath the tires, which causes the RV to tilt and get stuck. 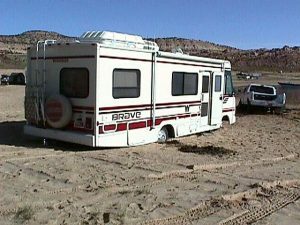 Always use large mats at your campsite to help keep sand out of your RV. No matter where you visit, every region has a season or two when the weather is unpredictable. 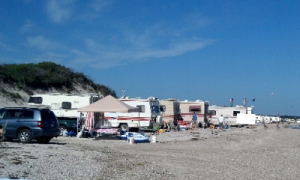 Bellman explained that RVers shouldn’t make beach camping a priority during windy seasons. Always be aware when tides take place. While you don’t have to be a meteorologist or learn everything there is to know about tides, it is important to know when they take place. While NOAA ceased printing and distributing its annual Tide Tables and Tidal Current Tables, current tide tables are now being printed and distributed under license through several publishers for your reference. There are smartphone apps for tide information. I use Tides. We have taken our fifth wheel trailer to Oceano Dunes in California for many years and pull out an average of 3 rv/4 wheelers every day. You need to take your tires down to around 20# for both the rv. and vehicle. You will need sheets of wood or plastic to cover the lower side of your rv. and tall stakes to hold them up. This will protect the underside of the rv from blowing sand. Bring a tow strap should you need to get pulled out or help pull someone else get pulled out. Drive slowly and don’t stop until you get your t.v. placed as you don’t want to get stuck. Then enjoy your stay.